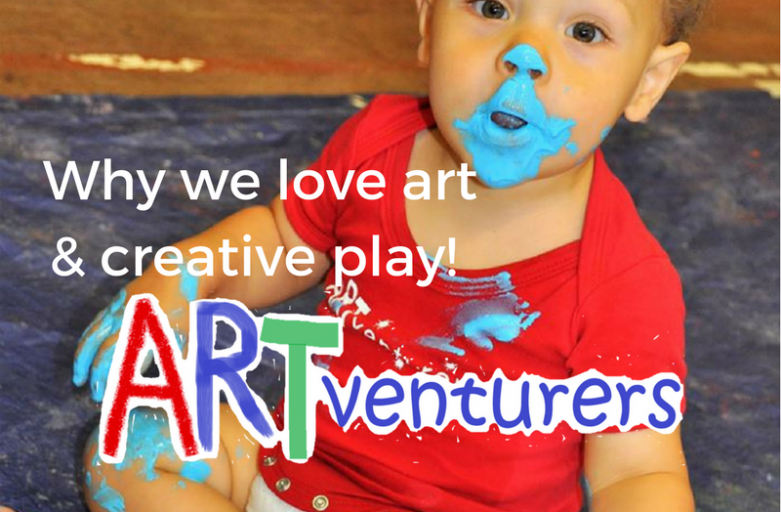 Why we love art and creative play! 1) To develop their motor skills! 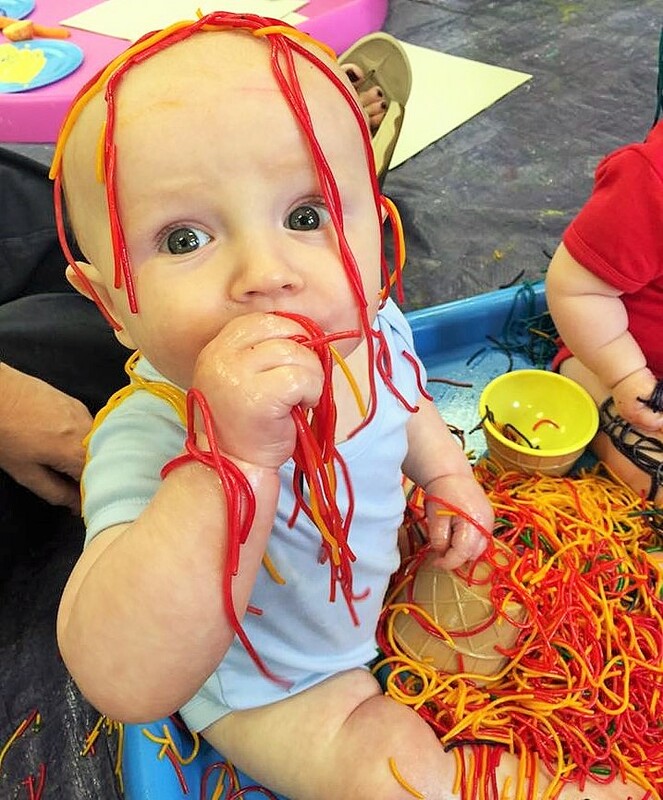 Baby ARTventurers will build up their hand-eye coordination with activities such as stacking, scooping, stirring and pouring, whilst squidging and moulding are great for muscle tone! For the older ARTventurers, playing with paint and using scissors all help to develop hand muscles and fine motor skills to prepare them for writing. 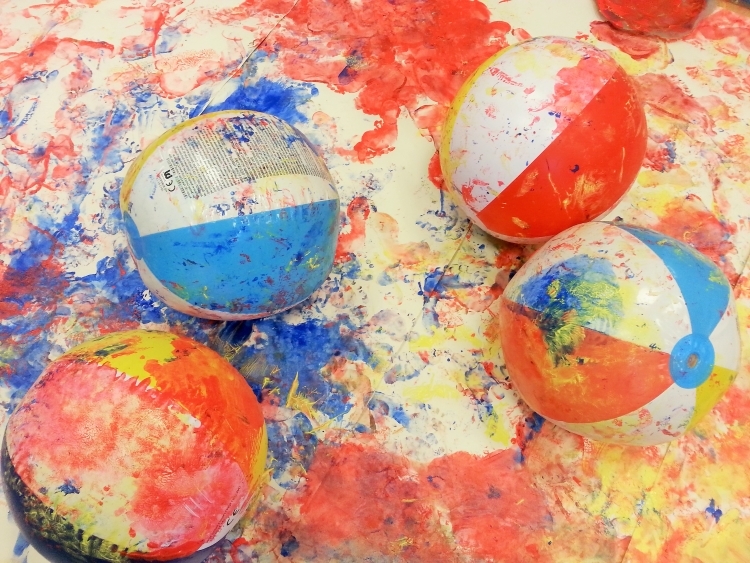 An ARTventurers favourite is painting with GIANT balls – rolling them in paint and then across the paper – which is brilliant for co-ordination and team work! 2) To help with their communication! 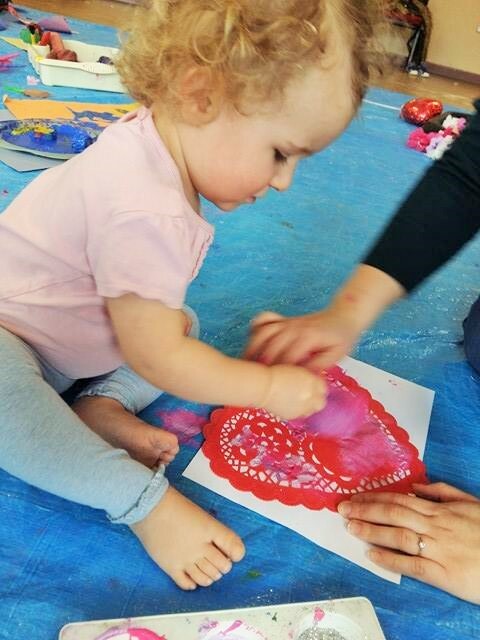 Art and creative play is a fantastic way for babies and toddlers to interact with grown-ups and other children, whilst learning new words and phrases. 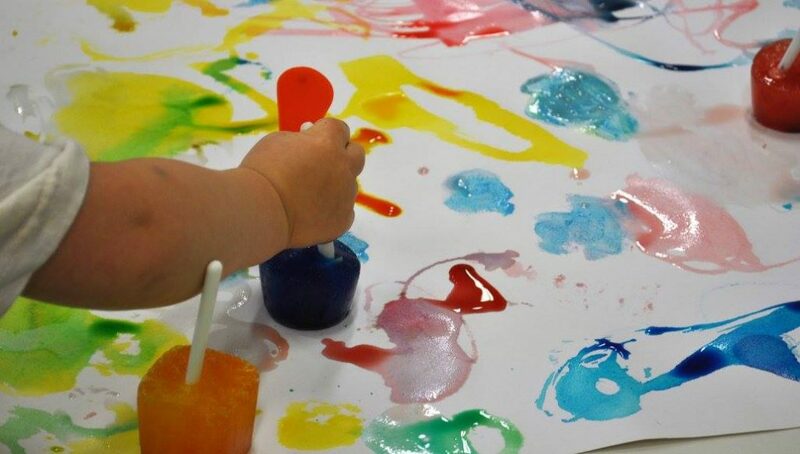 Making marks on various materials is your child’s way of expressing themselves to you visually, while talking about shapes and colours helps pre-school language skills. Our FAB ARTventurers classes incorporate music making and singing too! 3) To allow them to express their feelings! 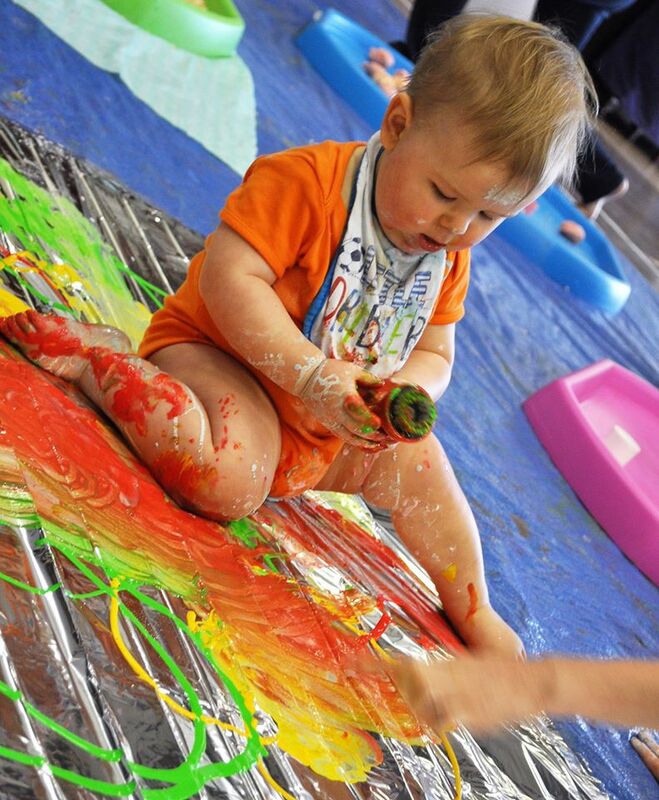 Painting and modelling (or just simply exploring a messy play tray during an ARTventurers class) allows little ones to express themselves when their verbal language skills are not fully developed yet! 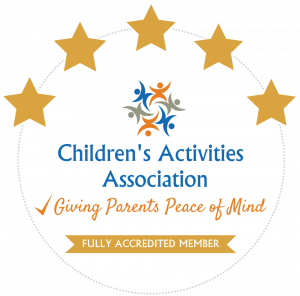 Active creative play also enables kids to release energy and it is a great stress reliever and can be GREAT for frustrated toddlers. Studies show that this can help with biting problems too! 4) To improve their self-esteem! 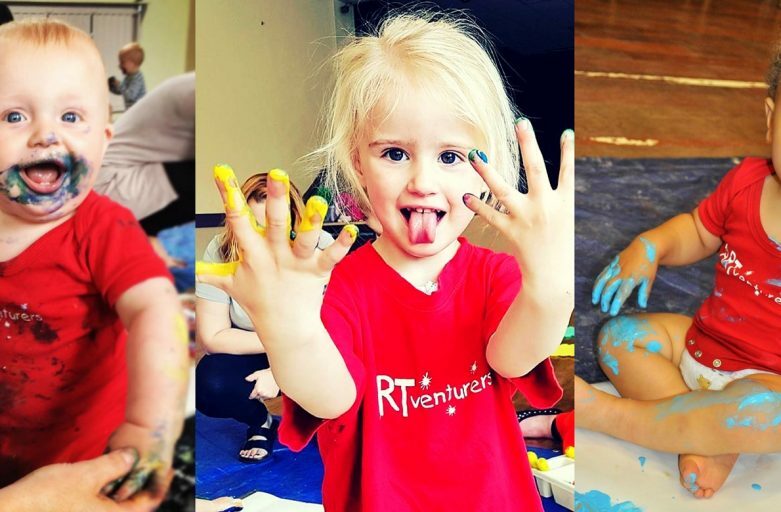 The main aim of ARTventurers is to develop and encourage ‘confident explorers’, so all sessions are designed with children’s natural curiosity in mind! 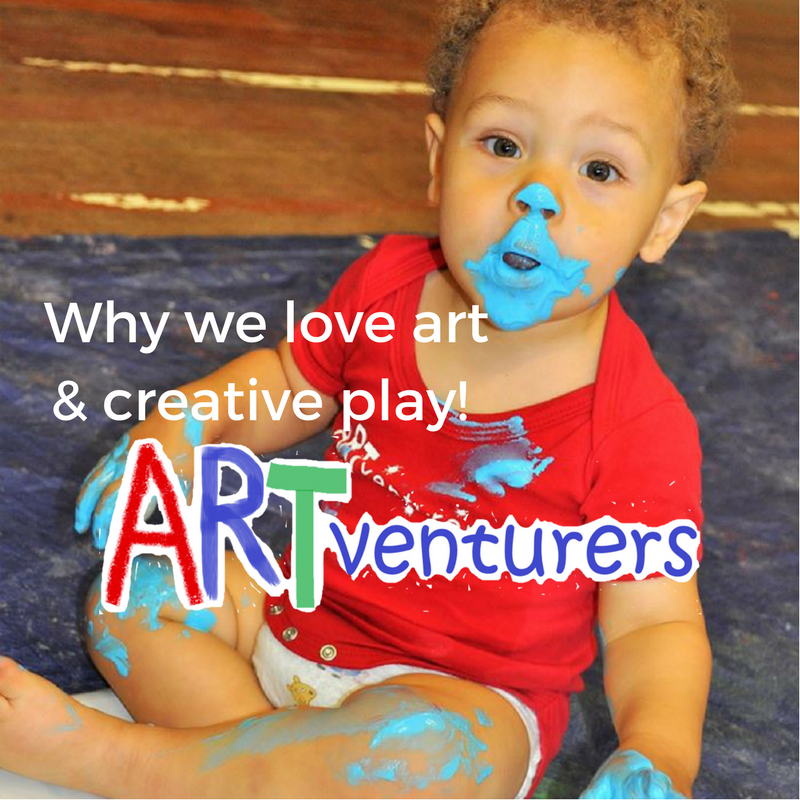 Here at ARTventurers, we strongly believe in the value of free-flowing activities and the benefits they can have on our little artists. 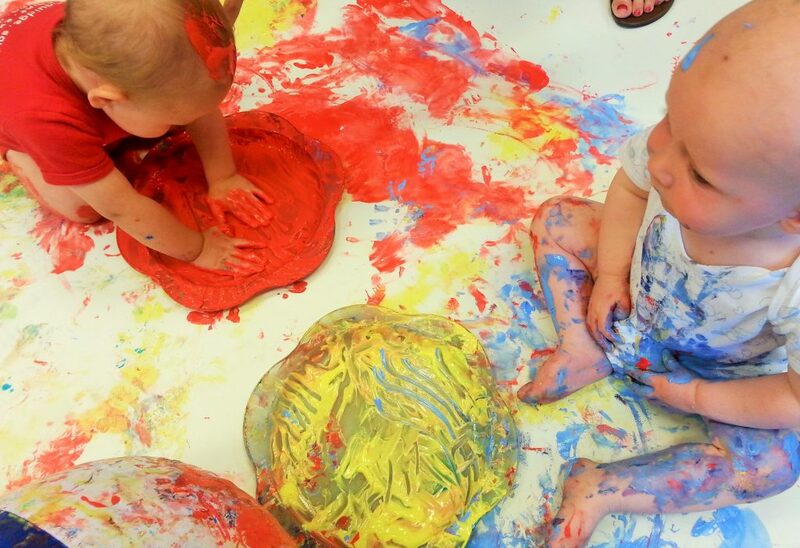 We believe that there is no right or wrong way to do messy play, so long as everyone is having FUN! This approach to creativity helps build self-confidence – as does putting their artwork on the fridge to show it off! 5) To learn to be hands-on! Children learn by using their senses and so the sensory, hands-on nature of art makes it a great tool! 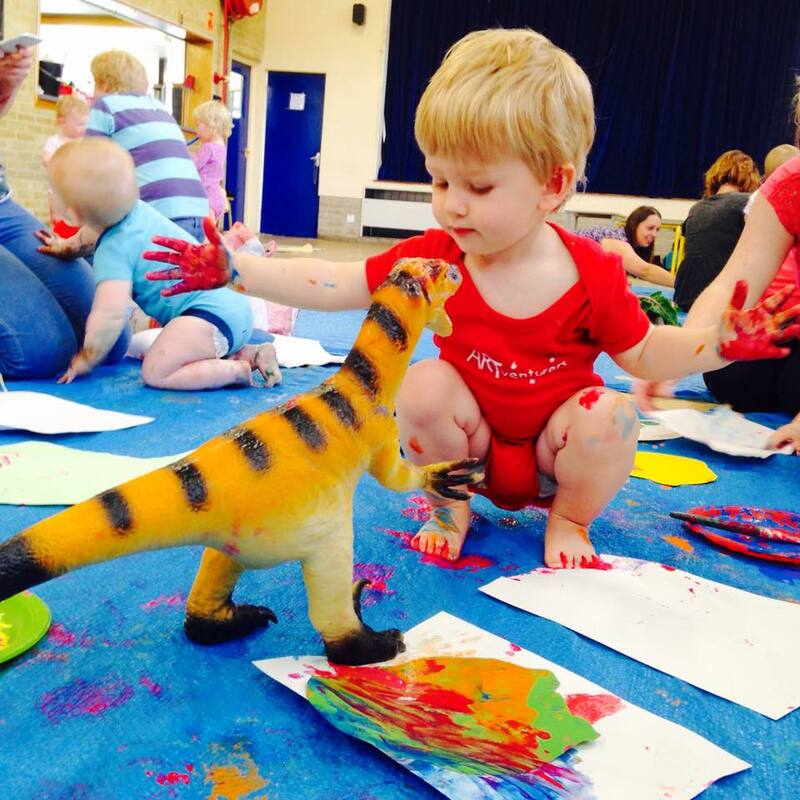 It enables children to learn about the amazing world by DOING – mixing paint, colours, drawing and painting objects such as animals! Trying out different tools and materials in an ARTventurers class increases sensory stimulation which is vital for brain development! Top 5 tips for using paint at home – the ARTventurers way! An example of the creative things that could be done on a big sheet of paper! 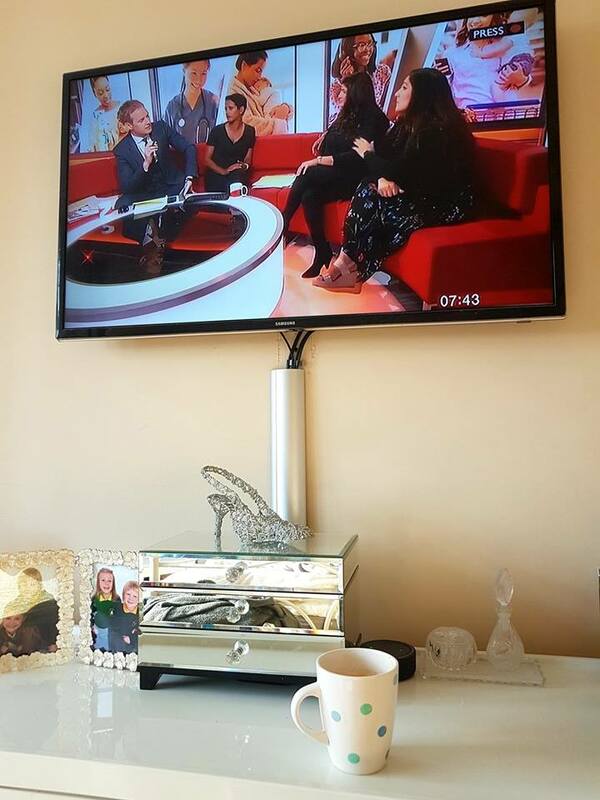 Obviously, your child’s safety comes before keeping your house clean and tidy! So before you all get messy at home, ensure you know the paint being used is safe for use with small children. You can even try and mix it up with edible paint from cornflour, as we all know how much young ones want to put everything in their mouth! There are plenty of recipes online about how to make edible paint, so be sure to check them out. 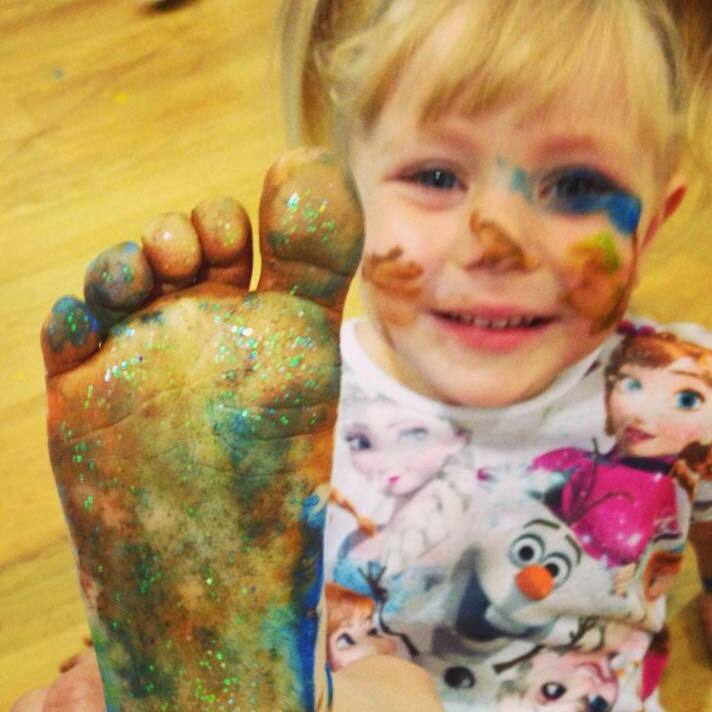 Feet are great for painting with! It’s hard to tell who is having more fun here! 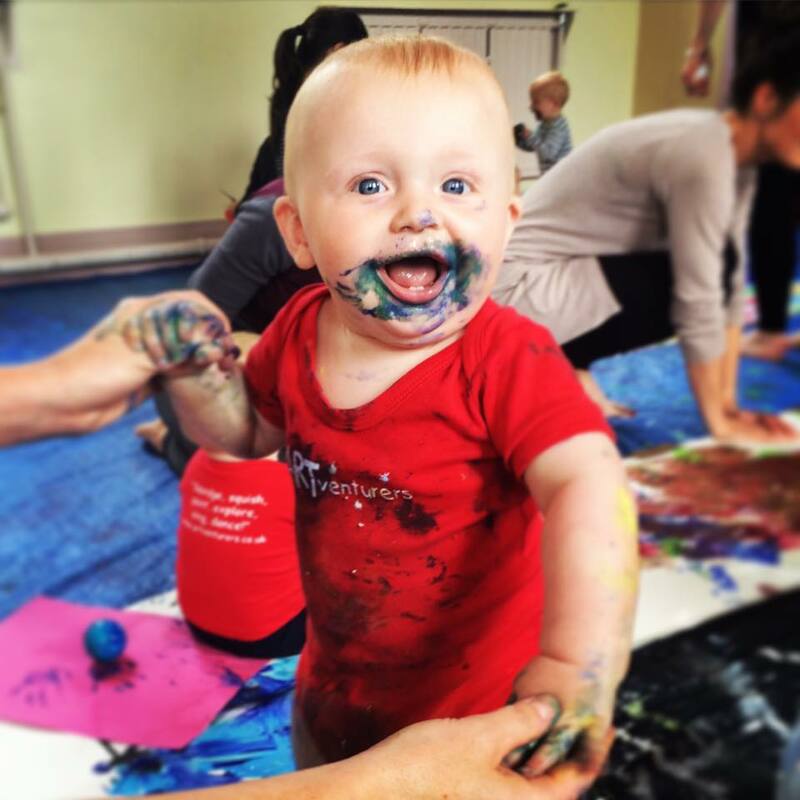 Unless your child is anxious about getting paint on their hands, leave the paint brushes in the box and use your body parts to create art instead! This allows them the freedom to investigate and explore the lovely colours and textures of paint, without having to pick up a brush! 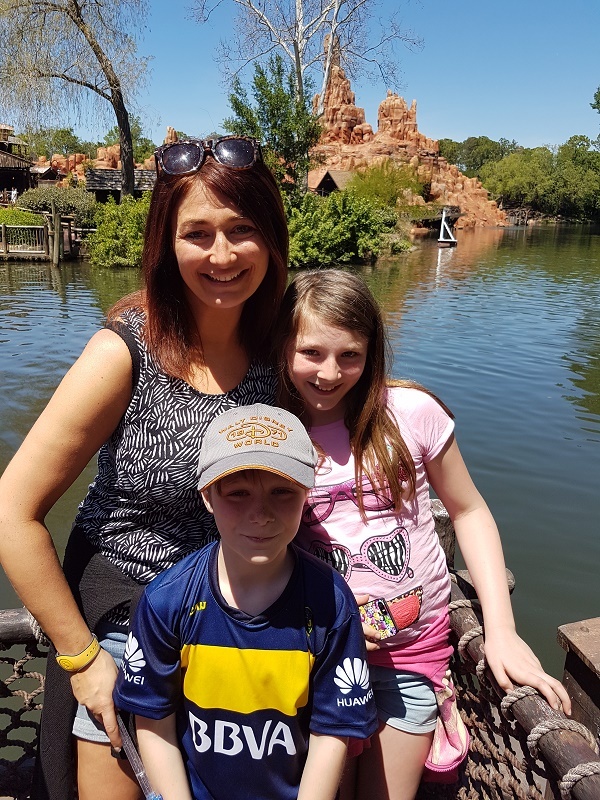 There are 5 tips and a bit of inspiration from the ARTventurers team that you can use at home to get creative with paint with your little ones. There are loads of benefits to letting children be creative with art from a young age, and these tips will help them do so! 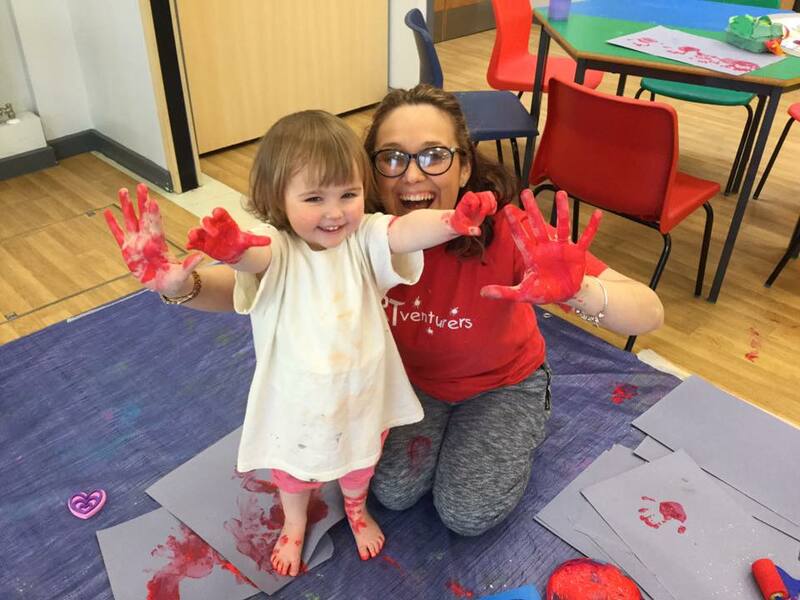 If the thought of letting your little one loose at home with paint still frightens you, an ARTventurers class takes the stress and worries away for you, so be sure to come along!